If you’re managing a website, then you want to make sure that your audience can visit and interact with it without any issues or delays. These days, lag times and server outages can cause significant setbacks for a site, leading to a bad end-user experience. But how can you be sure that your visitors are getting the best results? How can you test your site across a variety of servers to see if there are issues? Fortunately, you can use a website monitoring service to keep an eye on your pages to ensure that your content is being delivered the way it should. Our best attempt at what monitoring a website with a magnifying glass would look like. 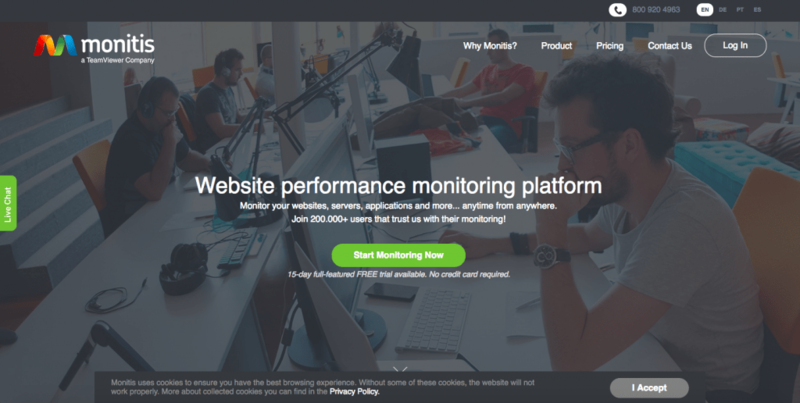 Today we’re going to be looking at the best website monitoring services and show you what they do and how they can keep your site at peak performance across the globe, 24/7. Let’s dive in and see what they have to offer. 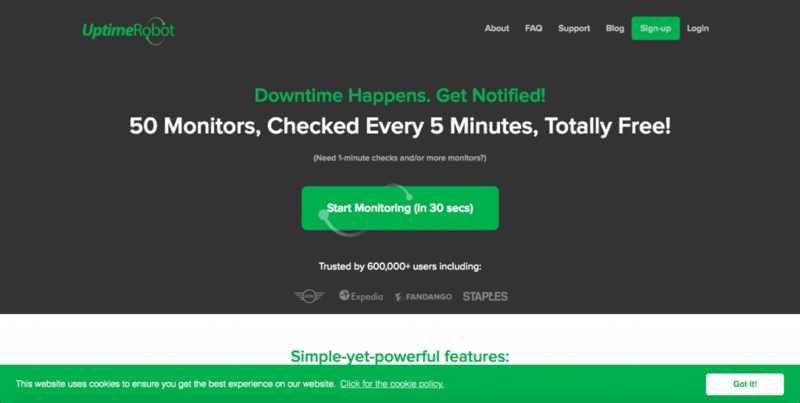 What is Server Uptime Monitoring? At its core, a company that offers monitoring services will interact with your website from a variety of different servers. The end goal is to pinpoint any issues like latency, hopping, or lag times. If a server goes down in Britain, for example, you want to be sure that your site reroutes so that people in the area don’t get an error message when visiting your page. Site Performance: are certain pages or links taking longer to load than others? What elements are slowing you down? Network Performance: how is your local network affecting your website uptime and speed? Knowing these details can help you reallocate resources to avoid surges that can increase response times. Server Health: are there bottlenecks that can cause problems in the future? Which servers are having trouble and which ones are working perfectly? In some instances, you may be able to control your server capacities and allocate your resources on the back end with a website monitoring service. If you don’t have a dedicated IT team at your disposal, it can be invaluable to have access to these extra monitoring tools so that you can take action instead of watching your site go down without any recourse. Uptime is the rate by which your site stays active. As long as servers are running smoothly, there shouldn’t be any reason why people can’t access your site anywhere in the world. However, no matter how careful people can be, servers will always be somewhat of a liability. With server uptime monitoring, you will get notified if there is an outage so that you can spring into action. Considering that you have to rely on a variety of different servers to keep your site running smoothly (i.e., data server, email server, FTP server, etc. ), it’s imperative that you can see how they are performing at any given time. 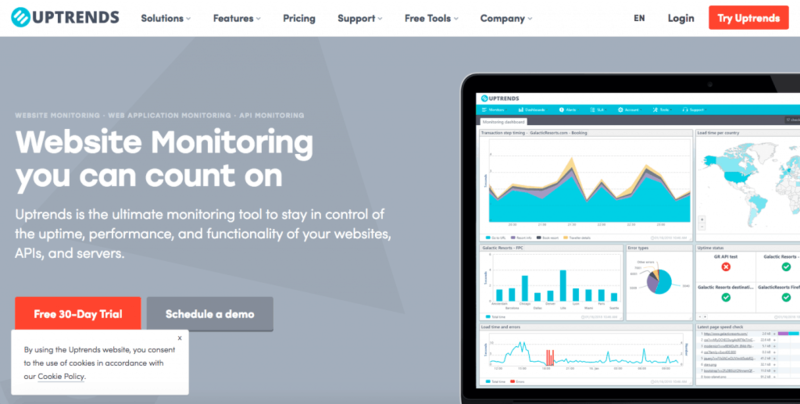 Many website monitoring services will offer this as part of your standard package, but sometimes it will be an additional service since it requires real-time feedback and notification. However it’s provided, you need to make sure that you have it, lest you experience downtime that will cost you. Fortunately, it’s never been easier to use a website monitoring service. For the most part, all you have to do is subscribe and input your site data so that they can check on it. When picking out the right service for your needs, it helps to make sure that they can work well with the size of your site. If you have a lot of traffic, for example, you need more detailed reports so that you can keep your IT team apprised of any potential issues. For the most part, many of these programs will have different tiers of service to meet your needs. You will want to go through and see what each option has what you need so you aren’t left with subpar reliability. Most of the programs that we’re going to show you offer free trials. However, what’s critical to remember is that there is a difference between a free subscription and a free trial. The latter means that you will have to pay money to keep using the same service, while the former will always be free no matter how long you stay active. If your site is still finding its audience, it can be hard to justify paying a hefty monthly fee for performance monitoring, especially if you don’t have a ton of traffic. As such, we want to provide you with some free options to help you get started. Each of these services also provides paid options, so if you like what they have to offer, you can upgrade and get better performance in no time. When looking at free monitoring services, you want to be sure that you can get decent returns without having to pay extra. 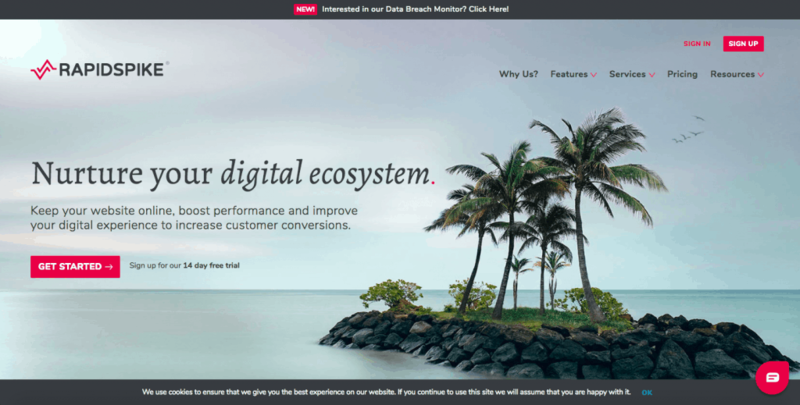 For the most part, free plans are going to be significantly limited compared to premium options, meaning that you’re just getting a basic handle on how your site is performing without a lot of extra details. Overall, for a free service, we like what Statuscake has to offer. However, if you have more than ten pages for your site, then you’re a bit out of luck. Fortunately, the paid plans are not too expensive. They also have an enterprise monitoring solution if you have more pages or need more control over your data. The Business plan can check up to 300 URLs and offers a 30-second refresh rate. 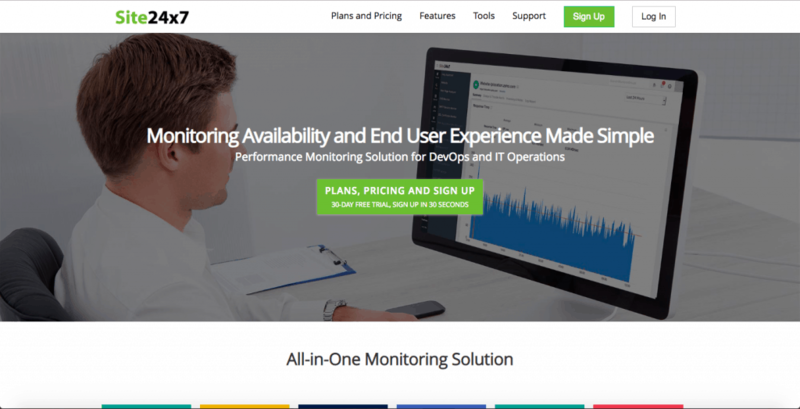 Started in 2010, the developers of Uptime Robot believe in offering free monitoring services for all sites. Since it’s imperative for anyone to keep their sites up and running, they want to provide a simple and effective solution for the masses. With their free plan, you can get up to 50 tests with a five-minute refresh rate. Also, Uptime Robot will log your performance for up to two months so that you can see how your site changes over time. The only downside is that you don’t get access to different monitoring locations. The service is based in Dallas, TX, so other countries can be spotty. 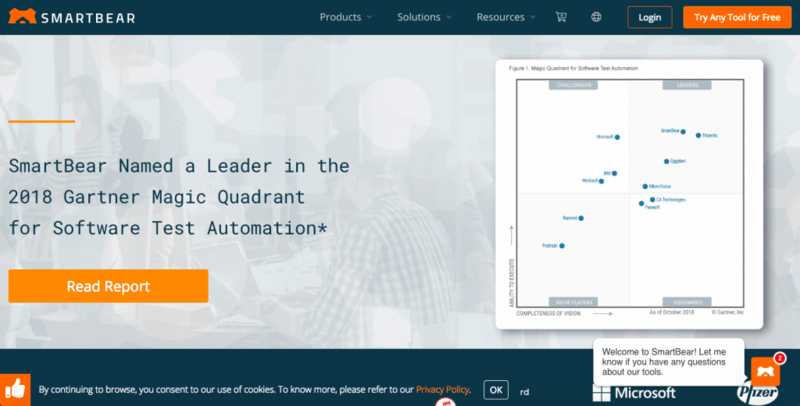 Overall, we like Uptime Robot as a free service, but it lacks a lot of the extra features that you can find with other companies. For example, they don’t provide pagespeed insights, so you won’t be able to see how quickly your site loads. Thus, if you are going to pay for a premium service, you may want to choose a different one. Although this site technically offers a free option, you shouldn’t plan on using it regularly. It only allows you to check up to three URLs, and the refresh rate is 30 minutes. If you’re running a small blog or something, it can help to get an instant check, but it’s not worth subscribing unless you’re going to pay. The premium option for Montastic is $29/month, and it allows you to check up to 200 URLs with a five-minute refresh rate. It offers email alerts only (no SMS), and it will notify you both when your site goes down and when it comes back up (a nice bonus). 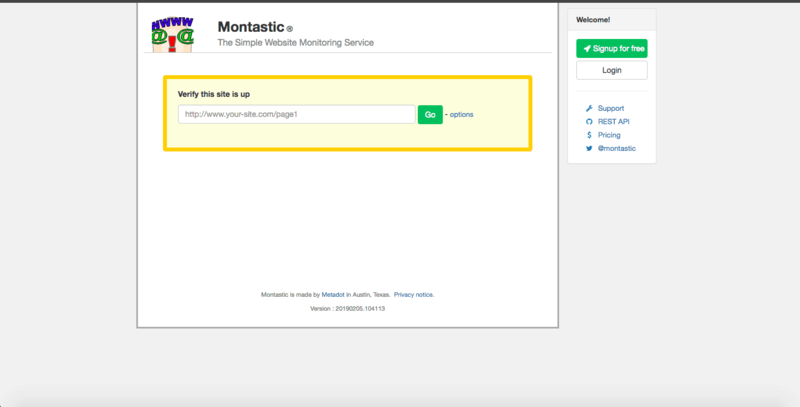 Again, if you’re managing a small blog or similar site, then Montastic might be enough for you. However, because it lacks a lot of the detailed features present in other monitoring services, we suggest paying premium prices somewhere else. As we mentioned, the majority of these sites will offer free trials. We highly recommend testing them out before signing up for a contract, just so that you can be sure that you won’t run into problems. 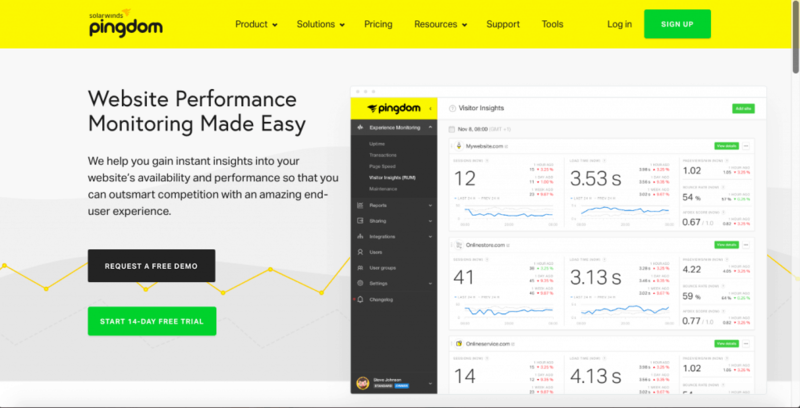 In addition to uptime and pagespeed monitoring, one thing that Pingdom offers is Visitor Insights. Here, you get actual data from people visiting your pages to see how you perform in real-time. This data can help you make changes to your site based on how people use it the most. Also, transaction monitoring is helpful if you operate an online storefront. See if any processing issues could lead to customer dissatisfaction. 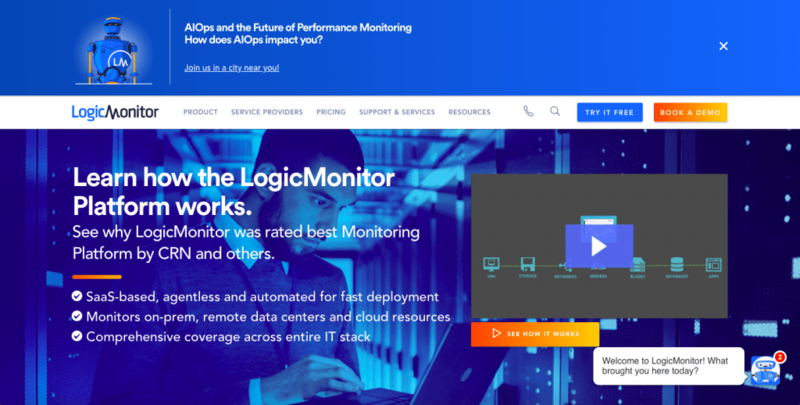 Overall, LogicMonitor is designed for IT teams. You can customize your reporting and analytics to meet your specific criteria, and you can fix issues on your dashboard. Although the number of URL checks is limited, it should be enough for most businesses. What’s really nice about New Relic is that it offers many more solutions than most website monitoring services. 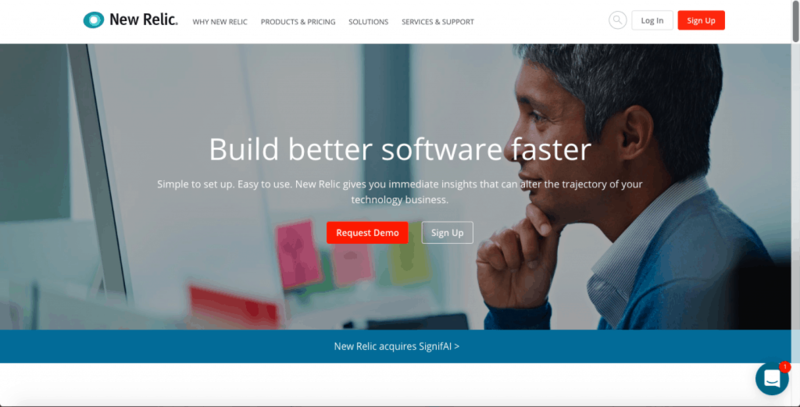 If you want more control over your data and how you can use it, then New Relic is the plan to get. Overall, it’s built for large companies that want a comprehensive solution package along with valuable data insights on their users. You will have to pay extra for some of these services, but they can be well worth it for the kind of analysis and control you receive. What’s different about UpTrends is that they offer basic and advanced monitoring packages. With the advanced options, you can customize everything from the number of checks to the speed of your intervals. Also, you get unlimited user data, and you can have any number of operators accessing the system. 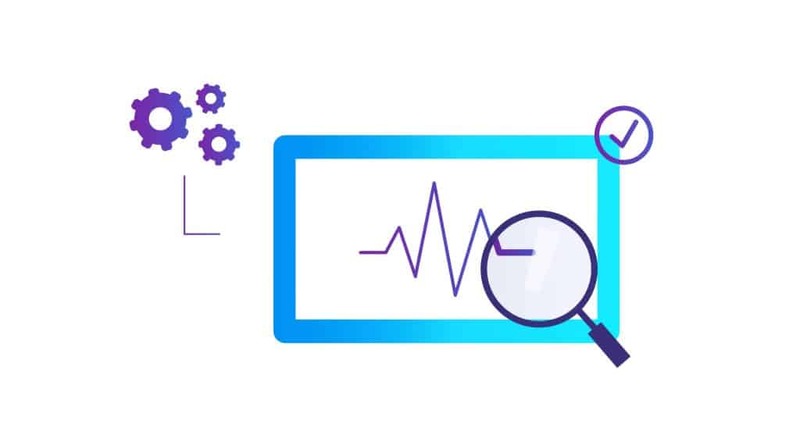 Although you only get a handful of intelligent page checks, RapidSpike also provides tests for RUM, API, and security monitoring. 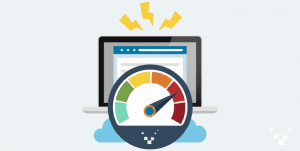 RapidSpike is different in that it doesn’t just check uptime and pagespeeds, but it gets a comprehensive readout of your site’s performance so that you can adjust accordingly. What we don’t like, however, is that you have to pay a lot for additional checks. Also, interval times are usually 10-20 minutes, which is much slower than most other services. Overall, RapidSpike does offer a lot of different data and analysis, but it’s much more expensive than other similar options. Monitis used to offer Monitor.us as a separate free service (although there was a premium option as well). Now they have merged the two to provide better monitoring capabilities. What’s really cool about Monitis is that you can pick everything for your plan. Input the number of monitors you want per month and get a customized price. Each monitor is separated by class (i.e., uptime vs. security), so you only pay for what you need. Monitis also offers enterprise and reseller solutions if necessary. Overall, site24x7 is both affordable and comprehensive. Each monitoring solution provides you with a lot of different data options and support so that you can fix any problems that may arise. We like it because it works for both low and high-traffic sites, making it a viable and affordable option for everyone. What’s nice about Host Tracker is that they are simplified for your convenience. It’s a relatively straightforward process, just give them your URLs, and they will handle the rest. 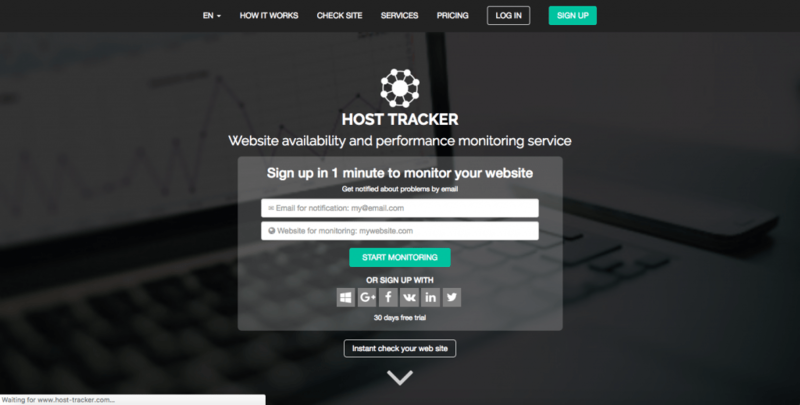 If you prefer to take a less intensive approach to website monitoring, Host Tracker may be a good option for you. Also, you get some additional services like AdWords management, and you can see if you’re on any blacklists. 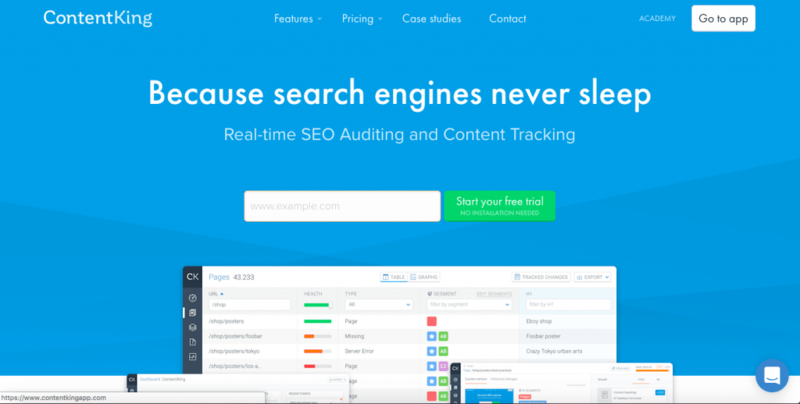 When compared to the other sites on this list, SmartBear is way more than just a website monitoring tool. This program is built for developers and programmers to do almost anything they need to do for their site’s performance. SmartBear offers comprehensive solutions to a wide variety of problems. There are so many options to choose from that it can be a little overwhelming. Overall, this is meant for professionals. If you don’t know what you need, then stick to a beginner-friendly service. 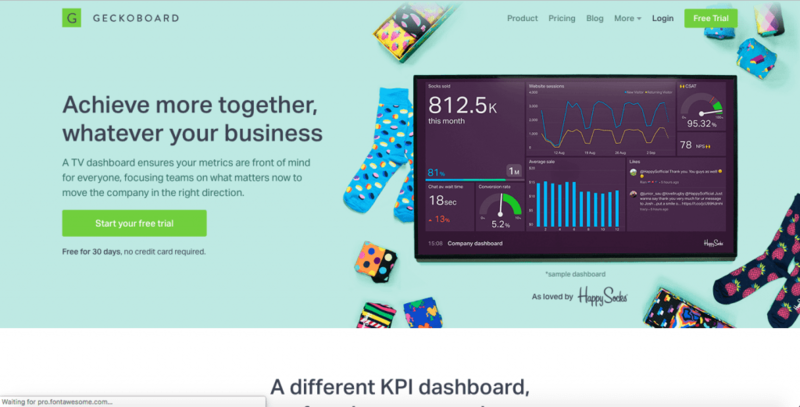 GeckoBoard is a different kind of service in that it allows you to build dashboards for displaying your site metrics. Rather than providing monitoring services, this program integrates with another monitoring service and projects it on a screen for your convenience. IT offices that can benefit from a centralized dashboard will like this service, but just know that it doesn’t actually test or monitor data. Instead, it just collects it and allows you to customize how you display it. This service is built for content creators. So, if you’re managing a blog or something similar, you will like what ContentKing has to offer. What’s cool about the pricing structure is that you pick the number of pages you have, and then you get all of the services that they offer based on that number. You can optimize your content for different devices, allow for collaboration across platforms, and monitor how your content changes over time. Your website is a crucial part of your business. Be sure that you’re monitoring it effectively and stay on top of problems before they occur. With the right website monitoring tools, you can keep your site optimized for peak website performance at all times. Welcome to the future.